Jane and I rang in 2009 with a small gathering of Airstreamers at Ocean Lakes CG in Myrtle Beach. 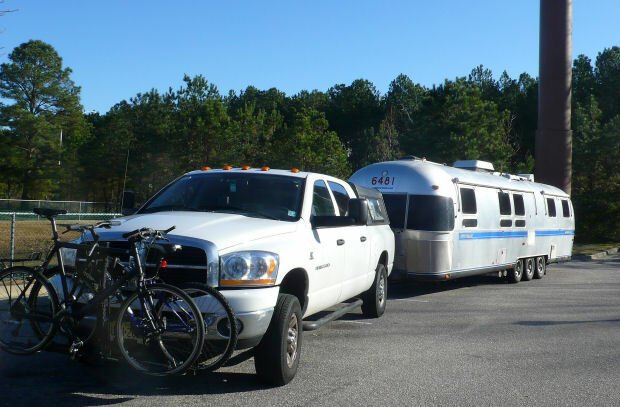 While our 2009 group was small in numbers consisting of five rigs, we had a great time putting the Airstream to use in December. Our home base is New York City (Jane) / New Jersey (Dave) and the winter months typically call for our rigs to be winterized and moth-balled as neither of us is close to retiring any time soon. In the Fall of 2008 when Paul Waddell from the WBCCI’s Washington DC Unit put out the invite to gather for the New Year – Jane and I discussed and decided the pull of the road was too great to pass up. And the idea of ringing in the New Year with WBCCI friends was very fitting for us. 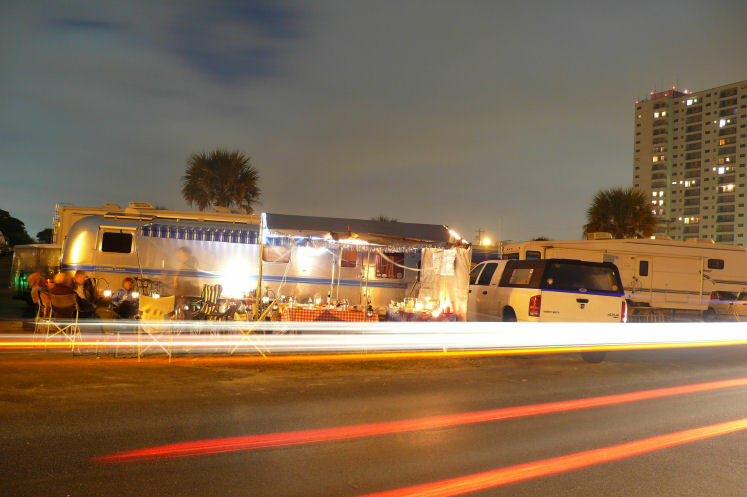 At the end of last years stay at Ocean Lakes, we signed up for a beachfront site for the 2010 New Year celebration. Fast forwarding to December 26, 2009...Jane and I departed our RV storage lot in Hewitt, NJ and embarked on our seven hundred mile drive to Myrtle Beach at 2pm that afternoon. First stop was for dinner at Holly’s located on Rt 50 and the eastern shore of MD. I have been enjoying Holly’s cream-of-crab since I started attending WDCU’s Cherry Blossom Rally in 2006. From Holly’s we made our way down to NC by midnight and pulled in to a Cracker Barrel for a free overnight stay. Sunday morning had us in the CB for breakfast and then back on the road for an afternoon arrival at Ocean Lakes. Check in time at the campground is 3pm. 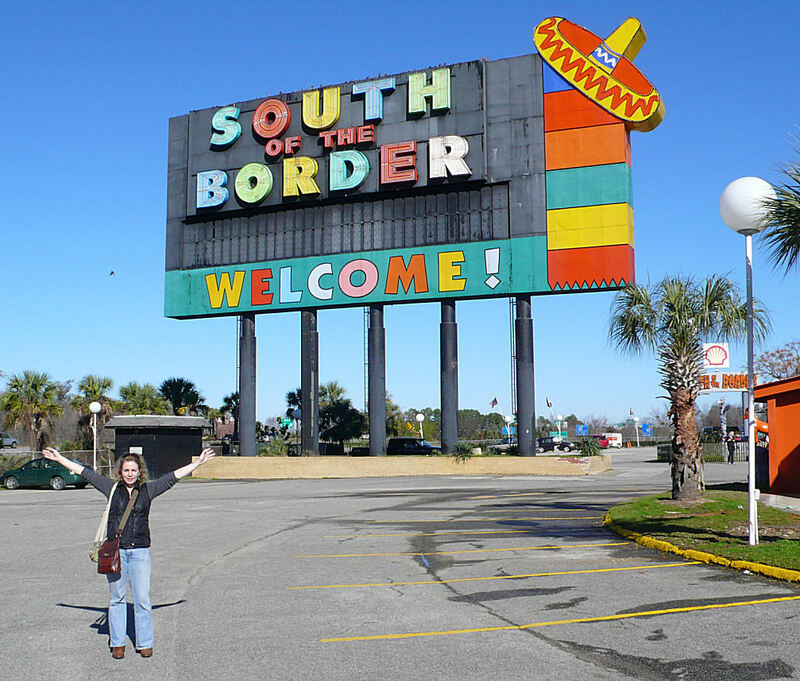 With some time to spare we made our way to South of the Border. Hard to believe but this was Jane’s first visit. I have made the NJ to FL drive ten plus times and always look forward to the spectacle offered by the billboards and the nightime lights of SOTB. Watching Jane take it in for the first time was fun. While at SOTB we did some obligatory shopping for cheap roadside trinkets and forked over a $1 for the ride up to the top of the 15 story high sombrero. The view from the top of the sombrero offered a good look at the RT 95 southbound traffic I was glad not to be part of. Jane, having crisscrossed the country forty times, is no new comer to roadside attractions and remains partial to the Little America stopover in Cheyenne. From SOTB we made our way east to Myrtle Beach and Ocean Lakes CG. After a smooth check-in we made our way to site number 2134 and got busy setting up our home for the next week. After an hour or so of feverish set-up we headed out for our first daily shopping foray. Sunday night we had my good Airstream buddy Pete Daniel and his friend Kayleen come by for some holiday cheer. Also in attendance for our first Myrtle get-together were Kim and Danee who also belong to the WDCU. As an aside, Pete was the first WBCCI'er I ever met (Floydfest) and was insistant that I join the club way back in '04. Pete enjoys the distinction of being a third generation WBCCI member. Not many out there can say that. This first nights party really set a wonderful tone for our week. Good friends and good cheer became the common theme for the week. Pete and Kayleen were only going to be at Ocean Lakes for a couple of days. This was Kayleen’s first Airstream trip and having done a ton of boating seemed to take to Airstreaming pretty naturally. We had a lot of fun catching up and sharing good cheer. The next day the four of us met up for lunch at a restaurant down by the Inlet. After lunch we all made our way to Ripley’s Aquarium. 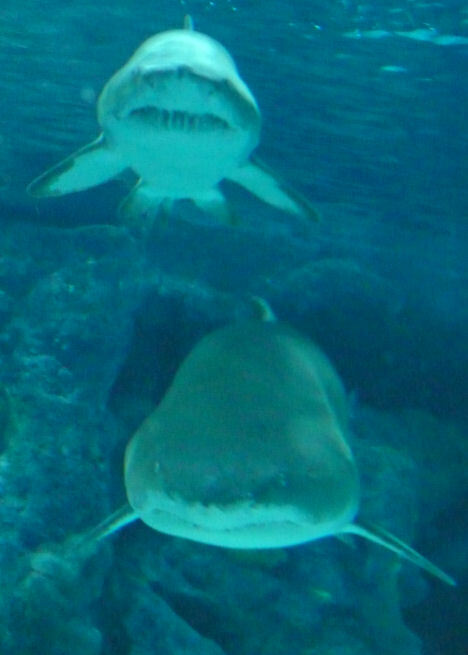 Having the Ripley’s name attached to it had me expecting to see two-headed sharks or other fish oddities on display. Surprisingly this was a straight up aquarium and offered us a fun time looking at sharks, turtles, and an abundance of other sea life, up close. Monday night Jane and I went on a bike ride hunt around the park looking find new Airstreamer arrivals. We paid a visit to the two Pauls and their wives from the New England Unit. They caravanned down together from CT and RI. We also did a fly-by to our new friend John from SC. John is the proud new owner of the identical rig to mine – a ’93 34 footer. The only difference between our rigs is that his looks like it just rolled off the manufacturing line and mine...not so much. His rig was an internet find out in Iowa and is in mint condition as it’s been garage kept most of it’s life. As the rigs newest owner – John is continuing with the garage treatment for this stunning rig. It so happens that John and his wife belong to the Palmetto State SC Unit which is part of Region 3. It is worth noting that this 'Not Really a Rally' event had WBCCI representation from Regions 1, 2, and 3, and five different Units - Watchung NJ, New England, Metro NY, WDCU, and Palmetto SC. Tuesday had us saying our good-byes to Pete and Kayleen as they were heading back to Richmond for New Years. We spent part of the day tweaking the campsite and more shopping. In true Lucy fashion (Long Long Trailer), Jane managed to bring a long a hundred pounds of candles to decorate the campsite with. Tuesday night was low-key and we stayed in and watched the first half of the movie 'The Hangover'. This movie title offered a fitting theme for this vacation. Wednesday has us back in the truck and making an 80-mile trip down to Charleston for the day. 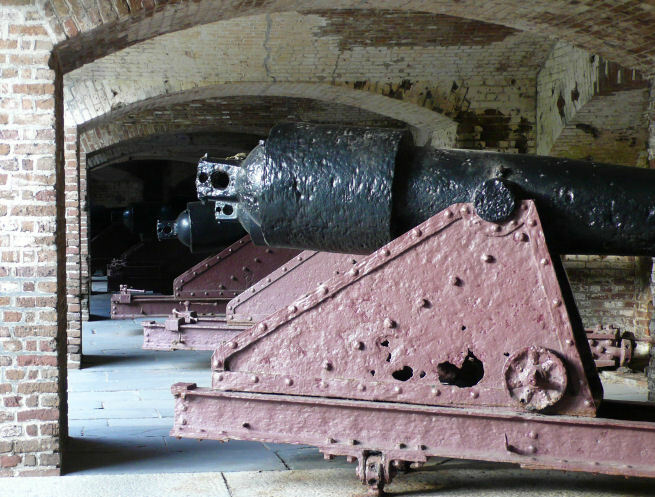 As a Civil War buff I looked forward to visiting Ft Sumpter – the site were the Civil War began. We had tickets for the 2:30pm boat ride out to the fort and arrived on time and walked on to the boat for the ride out to the fort. Among the rich history of the fort, we learned that the island it sits on is actually a man made island that was strategically placed at the entrance to the Charleston harbor. It was awesome to take in what is left of the fort and to walk the hallowed grounds of American history. If you are not a history buff I recommend skipping the trip out to Sumpter. Not much there besides a few canons, brick ruins, and a gift shop. It was at the gift shop where Jane convinced me I needed to purchase a National Park Passport. 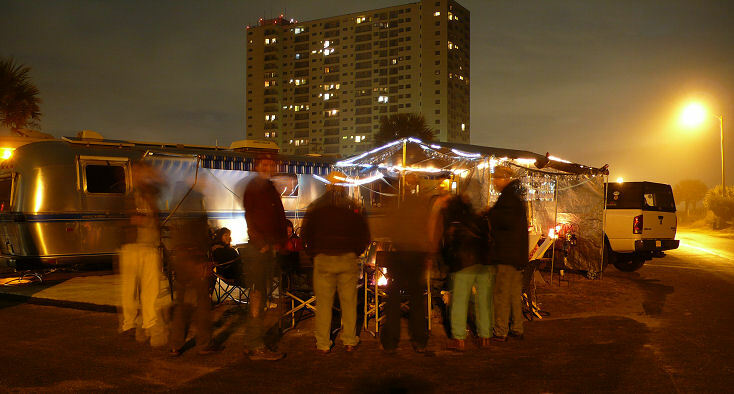 Jane convinced me that the Passport is a fun keepsake and long term Airstreaming project. The notion struck my geek cord and decided I would give it a try. In this one Park visit I managed three different cancellation stamps. I really am a geek! Where is my propeller beret? From Ft Sumpter we made our way over to the Battery Park section of Charleston to check out some of the homes the City is famous for. They grandeur of the homes did not disappoint. Sadly the lighting did not cooperate for any decent photo taking. We will get them next time. After our quick car tour we started on our way back to Ocean Lakes. We arrived back past Happy Hour but did manage to get some socializing in on Wednesday night. Tom Jacobs of the WDCU made a day trip down from his home in Wilmington NC and came bearing pecan pie gifts. The Hamers and the Novaks from the Metro NY Unit arrived on Wednesday. The campfire kept us all warm as it did all week. It is worth noting that the days were cool and the nights were downright cold for most of the week. Btween the furnace and hot water heater, we burned about 50 lbs of propane throughout the week. Catching up with Tom was a real treat. It had been more than a year since he had shown up at the WDCU event – or in the case of this ‘Not Really a Rally Rally’ and he was able to share touching stories of his brother Bill who passed on last year. Thursday was the big New Years Eve party. The festivities started at about 4:30 with Happy Hour, which rolled right into dinner. The last of the arrivals, Linda and Wayne Moore, showed up on Thursday and were in attendance for the New Years get together. They popped in on the fun while on a return trip from visiting Sue and Hunt Jones in Braden Castle Park, FL. Briefly, Braden Castle Park is located in Bradenton, Florida and was founded in 1924 by the Camping Tourists of America, a group of Tin Can Tourist members. For our New Years Eve gathering, Paul and Mary Kim brought over enough spaghetti and sauce to feed a small WBCCI army. This contribution was in honor of their daughter Virginia’s eighth birthday. The buffet table looked great with salads, garlic bread, and desserts filling every inch of the space. We had about fifteen WBCCI’ers in all enjoying the good food and cheer. After dinner we all sang Happy Birthday to Virginia and she blew out the candle. This launched us into the second half of the evening – the full moon New Years Eve celebration. By midnight there were only a few still standing to ring in the New Year. I guess that is what you can expect when the marathon party started at 4:30pm. Having been sufficiently pickled from a weeks worth of Happy Hours I do barely remember popping the champagne cork and handing out cups at midnight. Not good on the memory loss but I do know it was a fun partying and ringing in the New Year with a good Airstreaming friends. Friday morning had us licking our wounds and reaching for the asprin. I don’t know how they did it but the New Englanders were all hitched up and heading home by the time a rolled out of the rig that morning. The weather report showed New England was seeing some snow so they all decided to beat it on down the line with an early New Years Day departure. We milled about the campground on Friday. Our big event for the day was to head out and fill up the fuel tank for the ride home the next day. 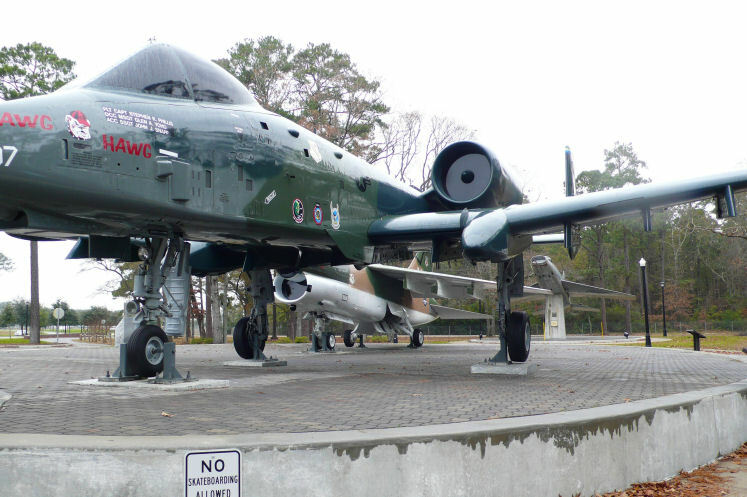 We stopped by the Myrtle Beach airport, which was formally an Air Force base with a rich and esteemed history spanning from WWII through to the first Gulf War. We stopped by the display of jets that honored the airmen that served at the base. The A-10 Thunderbolt, better known as the Warthog, is on display there. It is one of my favorties -- geek. What a wonderful ground attack killing machine. Ya gotta love a modern jet fighter that features an old-school gatling gun under its nose which can let loose seventy 30mm rounds per second. One word -- OUCH! After our short trek through the airbase park we made it back to the campground and mustered up the Metro NY folks for Happy Hour and BBQ. Saturday was a travel day for those who were left and we all called it an early evening. Jane and I finally watched the second half of The Hangover. Man was I feeling it. Saturday had us up and out of the rig early. I set about tearing down our wonderful shantytown campsite. I packed up the 12x12 canopy, the space heater, the new fireplace, the bikes, sound system, and everything else that helped to make for a comfortable stay at Ocean Lakes. Joe Fodor, Watchung Unit's unofficial quartermaster, would have been proud of our set-up. Joe is widely known for carrying more stuff to a Rally than any other WBCCI member in the country. The morning had us set about blowing out the pipes and winterizing the rig for the cold ride home. As we were leaving Ocean Lakes we stopped in the office and reserved our beachfront site for New Years 2011. The ride back north was fortunately uneventful for us. 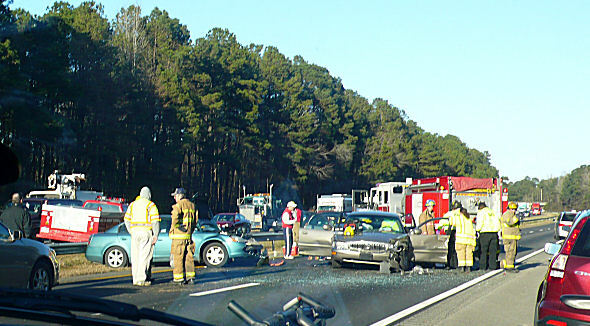 We did come up on a four or five car wreck did slow us down on RT 95 in NC. The CB radio was handy in hearing what was going on in terms of the traffic. Truckers do have a way with words. I just can't get the lingo down. Anyway, moving further up 95 in NC we passed our good friends Howie and Braith as they were making their way south to the AirForums.com Can Opener Rally. H & B had also passed the Waddell’s earlier in VA who had a couple of hours jump on us departing from OL. We made it up the Bay Bridge by 10:30pm. The ride across the really high bridge had me holding the wheel with two hands. Winds were up and I wasn’t taking any chances. The Hensley Arrow, as advertised, did a wonderful job in helping to keep the rig between the lines as we crossed the Chesapeake in windy conditions. News radio was warning of 50+ MPH winds. We did fine and made our way to the Walmart Supercenter in DE by midnight. As we always do when taking advantage of free stopovers – we went in to Walmart and made a purchase. In this case we purchased a gallon of RV plumbing anti-freeze for Airstream's sink traps. We walked out to the rig and crossed what felt like the blustery frozen tundra of the parking lot. We set about getting the furnace lit, and brewingd water for the french press. Round one of drinks Sat night had us warming up with Jamaican Coffee for Jane (Captain Morgan, coffee, and whipped crème) and Kentucky Coffee (Jim Beam, coffee, and whipped crème) for me. Once we were warm we uncorked the last bottle of wine for the vacation. What a wonderful way to celebrate the week and unwind from a long day on the road. The wind never let up all night. While the Airstream was warm, the wind howled and rocked the rig all night. It reminded me of what it was like sleeping on my old sailboat in a storm. We slept in on Sunday morning giving the wind a chance to die down a bit before we had to cross the Delaware Memorial Bridge. We made it to the Cracker Barrel on the Jersey side of the bridge in time for a late breakfast. After breakfast we made our way north deeper into the frozen tundra. 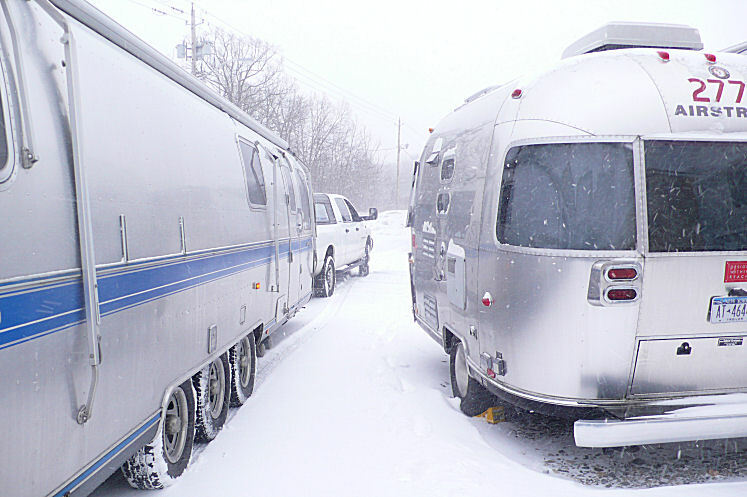 When we were twenty miles from the RV storage lot in Hewitt, NJ the snow was falling. The exit ramp off RT 287 was covered in snow and offered a quick reminder to take it easy. The trailer never hinted at slipping sideways which was my biggest fear as this was my first time pulling an Airstream in the snow. We made it safely to the RV lot and backed it into the space in one shot. As always, Jane jumped out of the truck and helped guide me into the parking spot making sure I did not back into her precious ’08 DWR Bambi. 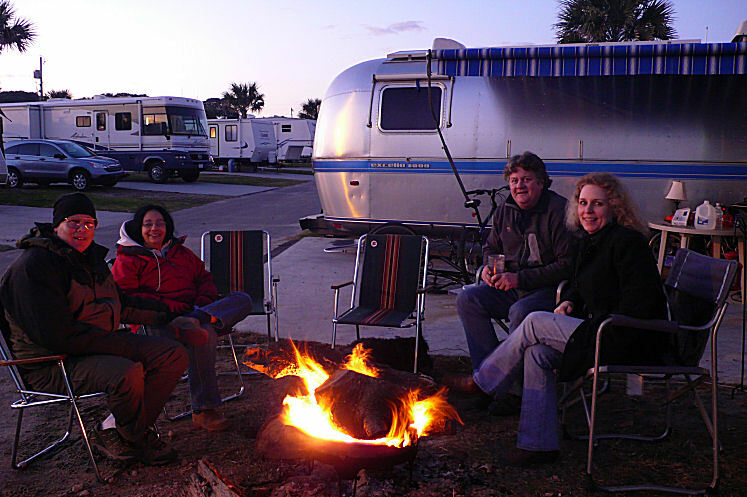 In spite of the cold weather that has gripped the country this holiday season, we had a blast Airstreaming in Myrtle Beach with our WBCCI friends. Here is to a happy and healthy 2010 for all. Special thanks to Jane for being a wonderful travel companion, co-pilot, and photographer. All photos presented here were taken by Jane Layman.